& Happy New Year to you and your fur-babies from Belle & me. Love the pic!! From me and Zoey! Glad to have you join us. Hi Leanna and pups!! welcome from Lucyfur and me!! Thank you so much! Happy to be here! Hey there, welcome to you and your fur babies! Hi Everybody! I'm new to this team but have been on SP for a while (coming back after a long absence). 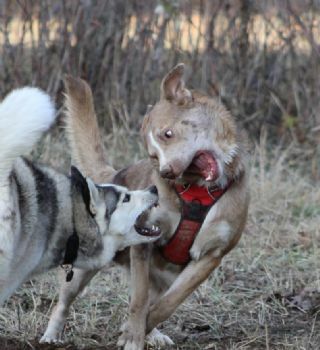 I have two dogs, a Husky named Luna and a Mutt (I say that in the fondest way) named Mocha Java Frappaccino Latte (aka Mocha).Here's a picture of them in their natural state, otherwise known as playtime bitey face (because a picture of them sleeping peacefully is less interesting). Happy to be on this team!